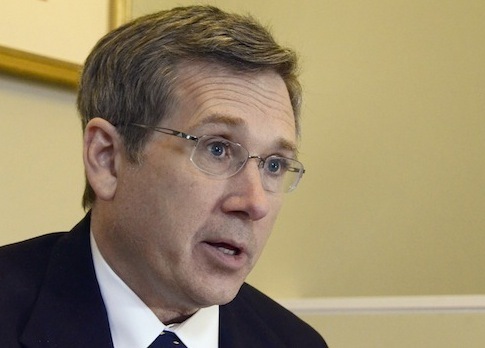 The gun control group Americans for Responsible Solutions rescinded its endorsement of Illinois Republican Sen. Mark Kirk over the weekend after he attacked his opponent's heritage in a debate. Americans for Responsible Solutions, headed by former Democratic Congresswoman Gabby Giffords, said in a statement it could no longer back the Republican. "In public office, your values matter as much as your votes," the group's executive director, Peter Ambler, said. "That's the example Gabby set in Congress and in her campaigns, and that's the example we must follow in the movement to reduce gun violence." "Senator Kirk's racist attack on Congresswoman Duckworth is unacceptable and represents a low point, even in this election season," Ambler continued. "For that reason, Americans for Responsible Solutions PAC is revoking its endorsement of Senator Kirk." During last week's senatorial debate, Kirk's Democratic opponent, Rep. Tammy Duckworth, touted her military service and family heritage. Kirk responded by mocking Duckworth. "I'd forgotten your parents had come all the way from Thailand to serve George Washington," he said. The comment was widely criticized and Kirk quickly apologized. Giffords' group endorsed Kirk and fellow Republican Sen. Pat Toomey (Pa.) in the 2016 election despite directing nearly all of its campaign donations against the reelection of Republican Sen. Kelly Ayotte in New Hampshire. The group has come under scrutiny for how it allocates its funds in recent weeks. Americans for Responsible Solutions said it will now support Duckworth. "While we believe the path to responsible change and communities safer from gun violence must include Republican champions, we cannot continue to support Senator Kirk," Ambler said in the statement. "A man who is not worthy of your vote cannot be worthy of our endorsement. As Gabby and Mark wrote in August, Congresswoman Duckworth is an American hero and a powerful voice for stronger gun laws. She will be an exceptional United States Senator." This entry was posted in Issues and tagged 2016 Election, 2nd Amendment, Gun Control, Guns, Mark Kirk, Tammy Duckworth. Bookmark the permalink.